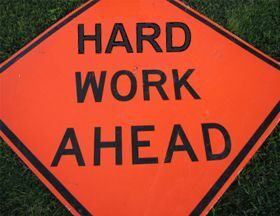 Work is the key to your personal progress, productivity and fulfillment. We often feel tired, not because we've done too much, but because we've done too little of what sparks a light in us. A man can work with an empty mind but not an empty stomach. Don't just make resolution to change, instead work for it. Any task that you undertake is called work. The work may be undertaken solely for leisure or a pastime. Work can also be undertaken to earn money and to learn something. Work is something that should be undertaken seriously and accomplished in time with the utmost dedication. Work is worship. So, one’s work or anything that is done for a living should be one’s top priority in life. According to Albert Camus, “A man's work is nothing but this slow trek to rediscover, through the detours of art, those two or three great and simple images in whose presence his heart first opened.” Working hard is the only way to carve a niche for yourself in your field of interest. One should not run away from work and must take up even the most daunting tasks or works as a challenge. Staying busy with work will keep you occupied and busy.